For many people growing roses can be an expensive hobby that they just cannot keep up with. Learning how to grow roses from cuttings can be a cost effective way to propagate roses without breaking the bank. As with anything in life, there are often easy ways to accomplish a task, and there are more advanced ones. Professional rose breeders and growers have a wealth of experience and funding behind them and can afford the luxury of advanced propagation techniques. For the purposes of this guide we are going to focus on growing roses from cuttings using one of the simplest and most cost effective methods available to any grower. Here we will give you the outline of what to do and what not to do. You should be aware however that this guide is not guarantee of success and you are sure to encounter a few failures along the way until you understand the process and learn the art form. Make no mistake about it, learning how to grow roses from cuttings is an art form indeed. 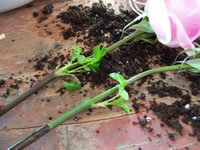 The first step is to make sure you have the proper setup for starting rose cuttings. You will need clean, sterile pots and potting soil for planting. This is especially important if you are reusing pots from a previous planting as you do not want any bacteria or diseases to transfer to the cutting, which could kill it before it ever gets started. You also should make sure the potting soil you select is somewhat loose and drains well, but it should contain some sort of wetting agent to retain a little moisture, otherwise it will dry out too quickly. Fill your pots with the potting soil, leaving a little space at the top so they don't overflow when you water them. Water the pots thoroughly and let the soil drain and settle completely. Then go ahead and water it once more to ensure that the soil is completely saturated. It is important however that you allow the excess water to drain out of the pot. Do not keep the pots sitting in a saucer with standing water. Push a pencil or garden stake into each pot and form a small hole that is slightly bigger than the cutting you will be placing in it. As important as it is to use sterile potting soil and pots, you should also make sure you are taking cuttings from a healthy plant as well. There is no point in trying to propagate a cutting that is already infected with some disease or is just overall unhealthy. This is another critical decision in learning how to grow roses from cuttings. You should also take the cutting off of a stem that either has bloomed recently, or is growing fresh buds. If you take your cutting off of a stem that isn't blooming or won't bloom, then neither will your cutting bloom. Once you have selected the right stem to cut from, make sure that you use clean, sterile shears and take cuttings that are around 5 to 6 inches long. Cut the stem at approximately a 45 degree angle above a set of leaves. It's ok to take the whole stem off the plant and then clean it up before you are ready to plant it. Make sure that you leave a clean cut behind on the plant you are taking the cutting from. Once cut, you do not have that much time to get the stems planted. If you need to buy yourself more time, wrap the cut ends in a wet paper towel so they do not dry out. The faster you get them planted the better. 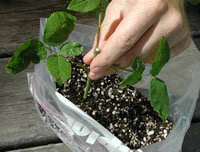 Now that you've got your cuttings, you need to prepare them a bit in order to start growing roses from cuttings. You will need to go ahead and remove all the leaves from the stem except for the top set. Again, make sure that you use shears or scissors that are not only sharp, but sterile. Make a deep angle cut at the bottom of the stem just below a bud or a leaf node. This is the point where the majority of the roots are going to form from. This node will be buried beneath the soil once planted. In order to increase your chances of rooting, you should gently scrape away the outer green skin from one side of the cutting at the very bottom. Be very careful not to cut too deeply, you only need to remove a small section, less than an inch at the very bottom, and take it down just until you see the white inside showing. 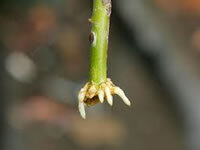 This little wound is important when growing roses from cuttings as it will give the cutting a much greater chance of rooting through those exposed sections. The final step in growing roses from cuttings is to actually plant your prepared cutting. Now you can just plant the cutting into the prepared pots you did in the first step, however you will have much greater results if you use a rooting hormone. There are a wide range of options for rooting hormones, however you do not need to go expensive. A basic rooting hormone available at any garden center will get the job done just fine. Have a glass of water handy when you do your final planting. Dip the end of each cutting into the water first, then into the rooting hormone. Gently tap the stem to remove any excess, then plant the stem immediately into the prepared pots. You will want to gently press the soil around the stem to support it, but you do not want to compact the soil. Using a gentle flow, water the pots thoroughly after planting and let them drain well. You will need to keep your planted stems in a humid environment until they root, which will take anywhere from 2 to 4 weeks. 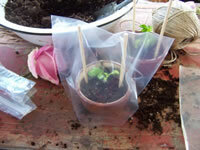 You can use simple clear plastic bags, or if you have a greenhouse, even better. You will want to store the pots in a shaded location that is not exposed to direct or bright light. An optimal temperature of 72 degrees is preferred. You will need to make sure that the soil stays moist during the rooting process, but too much water will cause you problems as well. It is a delicate balance that needs to be monitored, however if done correctly, you will have successfully started growing roses from cuttings.